It’s our second Weekend Warrior weekend, so today I’ll be moving right along through Britain’s history from the early Roman conquest that established Londinium to the time of Anglo-Saxon London. 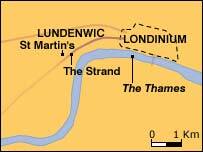 Though they don’t dwell on the same exact site as Londonium, the Anglo-Saxons settle just outside the Roman walls in what they call Lundenwic (today, the approximate site would be along the Strand from Trafalgar Square to Aldwich!). These people are known as the Middle Saxons (the namesake for present-day Middlesex), though are eventually absorbed by the kingdom of the East Saxons. Under King Ethelbert of Kent (the first English king to convert to Christianity), the very first St. Paul’s Cathedral is built in the year 604, albeit of far more modest stature than the one now standing on this site. Indeed, as it is only made of wood, it already burns down in 675, about two to three decades after Christianity has been established permanently in the kingdom under the reign of King Sigebehrt II.